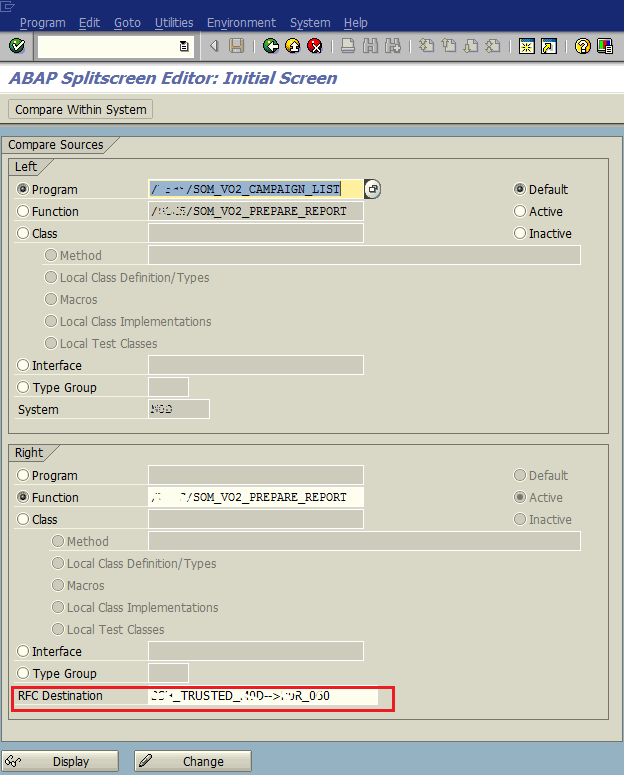 SAP programmers can compare code in ABAP reports from different systems using transaction SE39 ABAP Splitscreen Editor. If you are an ABAP developer coding on multiple systems, you probably require to maintain many programs from different systems and frequently check and compare codes of a program running on seperate SAP systems. SE39 ABAP Splitscreen Editor transaction makes ABAP code comparison easier for programmers. You can see two ABAP objects including ABAP reports, function modules, class codes, etc. on the same screen side by side. If SAP user wants to compare ABAP repository objects other than ABAP programs, ABAP Repository Comparison wizard is an other alternative way of comparing ABAP objects accross SAP systems. Press on "Compare Different Systems" button on the top menu for using SE39 SplitScreen Editor is for comparing ABAP objects from different systems using RFC Destination entry. Otherwise if you want to compare objects in the same system press on "Compare Within System" button. Here is sample SE39 entries for comparing ABAP codes of a report from different SAP systems. Note that the RFC destination is provided. Program name is entered in both Left and Right sections with Program option is selected. When "Display" button is pressed by ABAP developer who wants to compare code in both reports running on different SAP systems, both source codes from two ABAP reports are shown on screen in a splitted mode. On top menu, when ABAP programmer presses Comparison On button, SE39 will check and compare both programs and enable user to highlight differences between two programs. When Code Comparison is activated, ABAP developer can navigate backward and forward among code differences between two reports and compare for making corrections if required. If the ABAP reports are identical, SAP programmer will be informed of the exactness of the reports as a message.